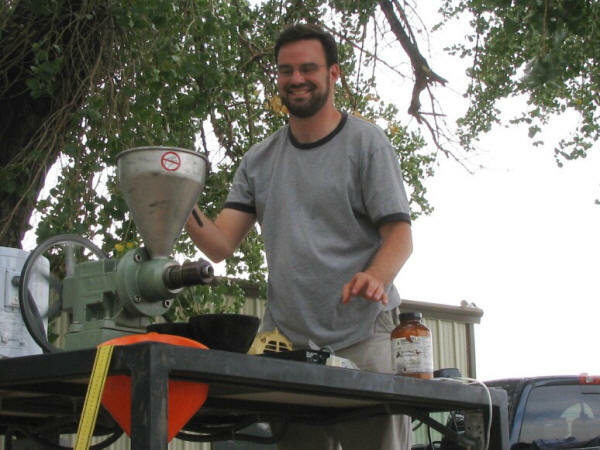 In August 2007, the South Big Horn Conservation District helped sponsor a biodiesel demonstration during the Big Horn County Fair. Other local sponsors included NRCS, Farm Bureau and the Big Horn County Fair Board. 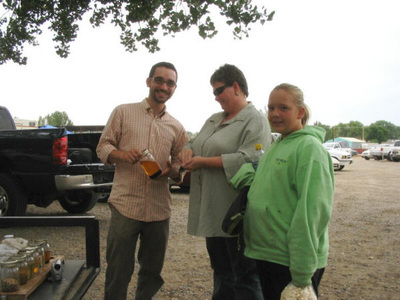 Micah Allen and Raphael Shay from iCast, a non-profit organization based in Lakewood, Colorado, brought a demonstration trailer with simple equipment that showed the process of extracting SVO (straight vegetable oil) from oil seeds and producing biodiesel. The SVO biodiesel can replace diesel fuel. The team was met with enthusiasm by farmers and ranchers interested in producing their own fuel and lowering their fuel costs. Many ranchers took home samples of the dry oilseed by-product to see if it was palatable to their cows. It was! Local farmer and rancher, Phil Boreen, added to the discussions with his own experience producing biodiesel for his farm use. Phil and Kate Boreen collect waste vegetable oil from restaurants throughout the Big Horn Basin and produce enough biodiesel to run three center pivots for irrigation. According to the iCAST website, www.cast.org "iCAST (International Center for Appropriate & Sustainable Technology) helps communities use their local resources for their benefit. Our projects foster economic viability, environmental stewardship, and social responsibility in under-served communities and a new vision for their future. We partner with organizations to help local citizens in the community development process. And we offer a unique service learning model for students to receive credit for working on these real-world projects. Our focus is building healthier communities. Our impact is a healthier planet."